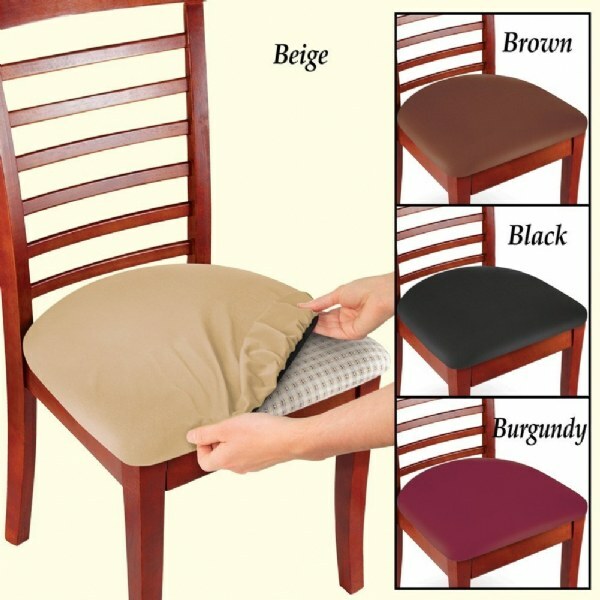 Chair covers stretch to fit oblong, square, round shaped chair seats. Hides wear and tear, rips, and tattered edges. Elastic edge holds cover securely in place. Fits office chairs, dining room chairs, bar stools, patio chairs, and more. Machine washable. My chair cushions look brand new. Chairs are antique with original old cushions they really look good now. Going to get more for other chairs and to have on hand to use when thes get dirty while they a being cleaned. Just what I was looking for. Fits snuggly on chair seats. Good size. great buy. I get so many compliments on my dining room chairs since I put these seat covers on them. I am very happy with my purchases. love them, am getting 4 more. Easy to use and you can just remove them and place in the washer. i love them i need 2 more! I haven&apos;t used them yet but they fit really good and I haven&apos;t washed them yet either, so that is why 4 instead of 5. I am in process of restoring my chairs now but they don&apos;t look like seat covers they fit so well. Really nice looking. It perfectly fits my chairs and looks really good. I hope they have bigger size covers so that I can use it for my dining room chairs too.